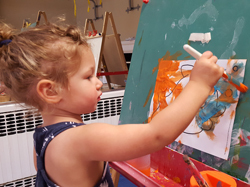 Unlock your child’s “inner artist” in The Connection’s art classes. Students also learn skills often not emphasized elsewhere including visual-spatial abilities, reflection, self-criticism, and the willingness to experiment and learn from mistakes. 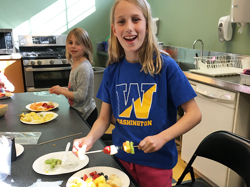 And, it’s never too early to teach kids the benefits of good nutrition and how to prepare healthy foods… and to have fun in the kitchen! Your kids will LOVE cooking at The Connection. Specialty classes at The Connection teach your child fundamental skills in a warm and welcoming environment which fosters creativity and self expression. Mixing art and gymnastics, you and your toddler will create a craft each week that reflects a new gymnastics skill. Teacher led instruction will be provided on all gymnastics apparatus. 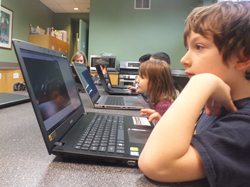 Delve deeper into the “why” and “how” of the world around us with hands-on experimentation. Play time in our big gym. Child must be accompanied by an adult. Space is limited. Passes available at the Front Desk. Mon., Wed., Fri. 12 – 1pm & Sunday 11 – 12pm and 12 – 1pm. Non-members welcome! Class in the big gym utilizing gymnastics equipment and specially designed ninja challenge course equipment for preschoolers (rock wall, cargo net, climbing rope, mini-trampoline and more). This coed class focuses on strength, agility, speed and most of all, FUN! A coed school aged class that will use strength, speed, and agility to complete a specifically designed ninja course. Ninja specific equipment will be used. An exciting class for you and your child to experience the fun obstacle course, as well as activities and games in our “big gym”! Join your child in exploring the “big gym”, developing balance and coordination, while having fun with new friends! Calling all bakers: Let’s make a new kind of cookie each week for you to bring home to share! Co-sponsored with the Special Olympics New Jersey, this program emphasized sports skill development in physical activity and play. Programs develop the fundamental prerequisite skills to prepare students to be future athletes. Teens and young adults meet twice a month for an evening of fun and camaraderie on the following dates: September 14 & 28, October 5 & 19, November 2 & 16, December 7 & 21, January 4 & 18, February 1 & 15, March 1 & 15, April 12 & 26, May 10 & 24, June 7. This one-hour program provides individuals who are physically or intellectually challenged the opportunity to use the pool for exercise, learn basic swimming skills, be part of a social group, and play games while having fun in a safe aquatic environment.